Nominated for three Academy Awards in 1950, Cinderella is among the most loved films created by all of Disney’s legendary Nine Old Men. Ham Luske and Les Clark animated Cinderella and Prince Charming in this wonderful Hand Painted Limited Edition Cel recreating Sequence 6, Scene 3. 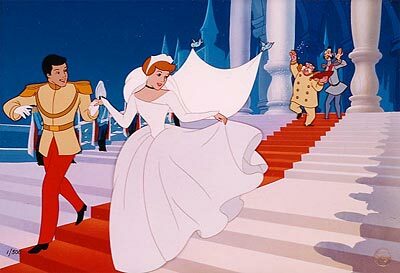 Cinderella was animated and directed by all of Disney’s legendary Nine Old Men. Marc Davis primarily animated Cinderella, one of Disney’s most likable heroines. Ilene Woods, a radio and television singer, provided the speaking and singing voice for Cinderella. She was also a great influence to the animators in determining the characters endearing charm and sweet personality.